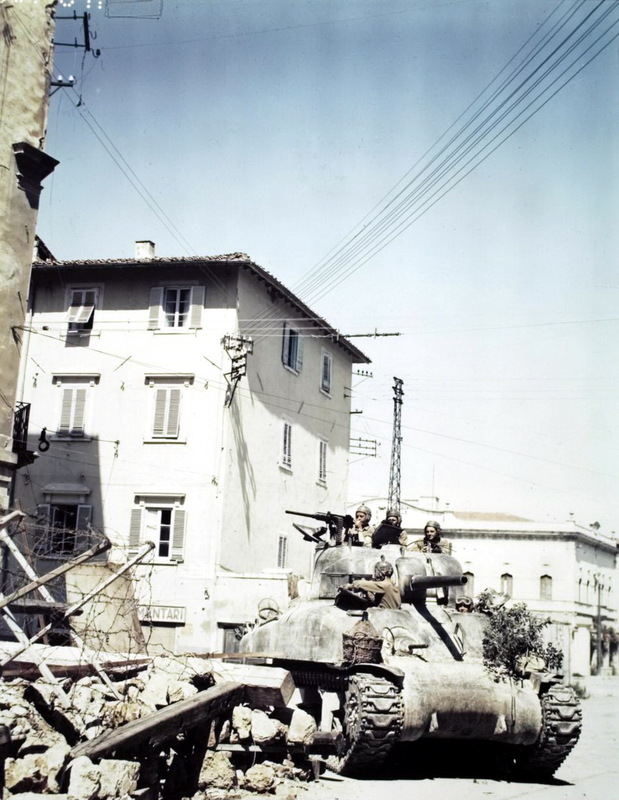 An American mid-production M4A1 "Sherman" tank from 3rd Platoon / B Company / 752nd Tank Battalion on one of the streets of the Italian city of Livorno, a port city on the Ligurian Sea on the western coast of Tuscany, Italy, July 1944. This is another staged action shot in the 22 July series of at least 4 colored photos (the other two photos have not yet surfaced). The rubble on the left side was placed there to designate the beginning of the "Zona Nera" (Black Zone), a heavily mined industrial district that civilians were forbidden to enter. The location is one block away from another photo that was taken in the same sequence, and Villa Bertocchini is the light colored building in the background. Both photos have been incorrectly labeled as 1st Armored Division tanks in various books and websites. However, the original photo caption in the National Archives, the markings on the tank, the historical facts, and the unmistakable identities of the 752nd men clearly indicate this is a 752nd tank. The men of the 752nd Tank Battalion distinguished themselves in some of the most difficult combat in the Italian Campaign. They recorded the highest number of consecutive combat days for any battalion in the entire Fifth Army (341), and became the only independent tank battalion in the Mediterranean Theater of Operations to receive the Presidential Unit Citation!